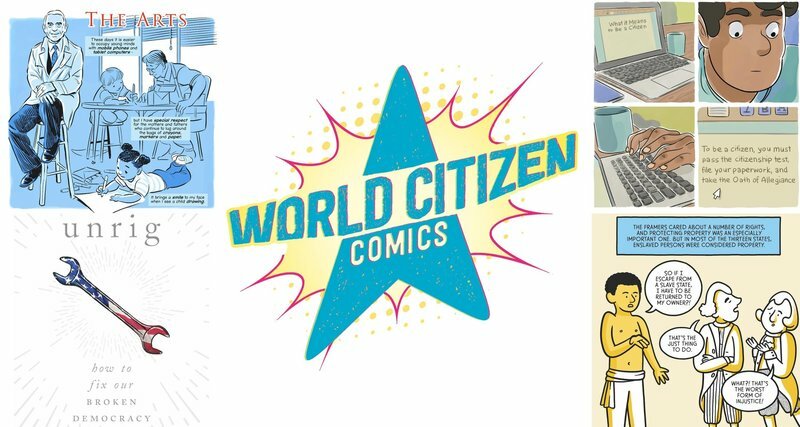 Firstsecond Books (previously, publisher of In Real Life, which I created with Jen Wang) has announced a new line of YA-oriented graphic novels called "World Citizen Comics," on contemporary activist themes like "how to fight corruption in elections, blast fake news with truth-telling, and even battle would-be dictators both near and far through a better understanding of constitutions and the rule of law." Included in the line are What Unites Us, a graphic adaptation of Dan Rather's memoir (co-written with Elliot Kirschner); Citizen Journalist, where former criminal defense attorney turned law professor Seth Abramson describes "how to ethically write and report on their world"; The Fault Lines in the Constitution, adapted from Cynthia and Sanford Levinson's accessible primer on constitutional law; The Media Adventurer's Handbook, Melissa Hart's comic about "Decoding Persuasion in Everyday News, Ads, Videos, and More"; Breaking (the) News, Jennifer L. Pozner's deep dive into "narratives shaped by news and media makers"; Unrig: How to Fix Our Broken Democracy Maplight founder Dan Newman's text on dark money and influence; and Re-Constitution, by political scientist and nation-state mediator Beka Feathers, who brings her experience in drafting new constitutions for states that have transitioned out of tyrannical autocracies into democracies to write a book explaining how the US Constitution fits in the global framework. This is a very exciting project from a publisher with a long history of producing incredibly successful, ground-breaking graphic titles for young readers; it couldn't be more timely.